Class-leading offshore energy support vessel (OESV) operator, Seacat Services, has signed a multi-million-pound contract to build a new next-generation catamaran for deployment in the offshore wind sector. 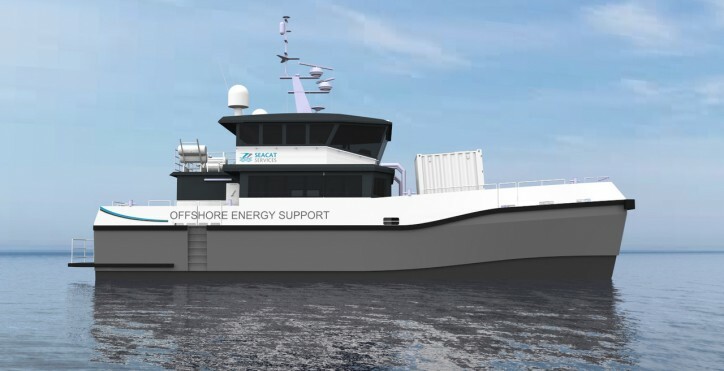 Seacat Weatherly, designed by Southampton-based naval architect Chartwell Marine, will be constructed by Isle of Wight firms Diverse Marine and Aluminium Marine Consultants (AMC) in Cowes, providing a boost to the renewable energy supply chain on the South Coast. The contract includes an option for a further vessel, which would see Seacat Weatherly joined by a sister vessel in the Seacat Services fleet. With unprecedented demand for specialist vessel support as large-scale offshore wind farms are brought online throughout the UK and Europe – and emerging opportunities in international markets such as the USA and Asia – the industry has been calling for a new generation of OESV designs that meet the evolving requirements of project development and operation. Capitalising on lessons learnt from the most effective vessels currently in operation, and refining this formula, is an essential requirement as the industry scales up. Scheduled for completion in March 2020, Seacat Weatherly is set to be the first Chartwell 24 catamaran to enter service. The Chartwell 24 vessel design has been developed by Chartwell Marine off the back of ten years of offshore wind vessel design and experience, alongside extensive dialogue with high profile stakeholders, including Seacat Services and leading wind farm owners and turbine manufacturers. For Seacat Services, the vessel – which can accommodate 24 industrial personnel, alongside 4 crew – will directly support its commitment to deliver the highest standards of safety performance, technical availability and ultimately ‘time on turbine’ for offshore wind technicians. Seacat Weatherly will boast one of the largest foredecks on the market, enhancing her cargo-carrying capacity, and has been optimised for safety, with designated walkways, handrails and safety sliding rails positioned for safe, repeatable crew transfer. Skippers will benefit from a unique wheelhouse configuration that provides total control and complete visibility during complex logistical and crew transfer operations. These innovations have been introduced without compromising on vessel performance, with Seacat Weatherly’s hull and engine configuration designed to provide superior transit speed and manoeuvrability, alongside high bollard push and frictional holding force – both of which are critical attributes for vessels ‘pushing on’ to offshore wind turbines and other infrastructure. Perhaps most significantly, the vessel design will offer high levels of operational familiarity for crews and technicians, meaning that Seacat Weatherly will fit seamlessly into the existing 14-strong Seacat Services fleet of class-certified OESVs.